99 Commercial Real Estate & Properties in Parramatta are listed in 3 categories. We have 73 OfficesLease , 25 Retail ShopsLease and 1 ShowroomsLease . Convenient Location | Fitted And Furnished | Professional Space $538pw | 3 Person Workspa..
PROPERTY OVERVIEW $538pw Price incl. 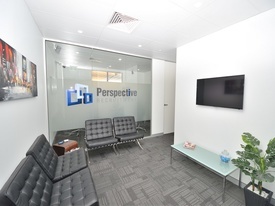 Beautiful private office space for rent in an A Grade corporate building in Parramatta CBD. Newly fitted with premium fixtures and furniture, this designer workspace is a stunning choice for anyone in professional services. On offer is a single person private office with shared access to meeting rooms and kitchen facilities, available on flexible agreements starting from 1 month. The new fitout showcases the cutting edge of collaborative office design with every modern facility: an immaculate reception/waiting area and an impressive 12 seater boardroom with video conferencing. Well lit and faultlessly presented, this Parramatta CBD office space ensures professionals have the environment they need to succeed. All inclusive rate and flexible terms starting from 1 month. 80 George Street is located on the corner of George Street and Horwood Place in the core of Parramatta’s financial precinct. The A Grade 11 storey building has newly refurbished lifts, facade and foyer, paid car parking levels, a cafe and disabled facilities. 80 George Street also houses a Wilson car park for additional parking options. This prime location gives the chance to work in Parramatta’s key financial and business district while being only steps from Westfield and public transport links. An absolutely premium office space in Parramatta at an affordable price enquiries and tours welcome. The advertised office space is perfect for a team of 3. If you need more or less space, we have over 30,000 furnished workspaces all over the world suitable for a team of 1 to 200+. Our award winning team offer a free service that will help you find the perfect solution for your needs, so reach out if you need more help. What you get for your weekly rent , Access to internal breakout areas , Building outgoings included , High speed internet , Electricity usage included , FREE use of the meeting rooms , One simple bill for everything related to your workspace , Regular cleaning Building features , Air conditioning , Car parking in building (Paid) , Car parking Street / Public Car Park (Paid) , Disabled access and facilities , Modern High Rise with fast lift access , New fit out , Onsite Cafe / Restaurant , Professional working environment 750m to Parramatta Station 650m to Westfield Parramatta Located in the heart of Parramatta CBD 550m to Parramatta Wharf 140m to Smith Street bus stops Who is Office Hub? Office Hub is the world\'s No.1 marketplace for office space. We have a huge global selection of coworking spaces, serviced offices and shared office spaces with flexible options to suit teams from 1 200 people. We\'ll take you on a tour of all the workspaces that fit your needs and work on your behalf to get the best price possible. We\'ll help you discover how shared office space can be the most beneficial and budget friendly solution for your business. www.office hub.com Conditions apply – the advertised price includes any incentives offered based on a 12 month agreement and is available to new tenants only. Please note that the rental rate may increase for a shorter rental period. A portion of the square meterage factors in access to shared space. + Prime retail space located at the Church St entrance to Westfield + Wide double frontage to Church Street + Rare opportunity + 220sqm + Within 50m to transport interchange Location speaks for itself! Belroy Property are pleased to offer 286 290 Church Street, Parramatta. An outstanding opportunity available to take advantage of on an existing Medical Centre fit out, alternatively convert to another retail use. Benefiting from a high traffic location, 286 290 Church Street, Parramatta offers the following areas available for lease; SHOP 1 145 sqm + Previously operated as a Pharmacy + Wide shop front to Church Street COMMERCIAL SUITE 1 370 sqm + Fitted out Medical Centre + 13 consulting rooms + Reception + Treatment room + Male/Female amenities + Access to Erby Place parking station COMMERCIAL SUITE 2 165 sqm + Located on Level 1 + Partitioned offices + Easy access to Erby Place car park + Lift access Areas may be leased separately or together. A Grade Building | A Grade Fitout | Close To Public Transport $607pw | 4 Person Workspa..
PROPERTY OVERVIEW $607pw Price incl. Premium service office located in the Deloitte builidng in Parramatta. Prices includes Internet, Telephone, Electricity, Kitchen use Flexi terms Close to transport Fully furnished Regular cleaning Best Building in Parra 24/7 access Personal receptionist Recognised building Avail NOW for short or long term rent The Deloitte building is the iconic landmark in Parramatta being it's tallest building.This work environment is ideal for any dynamic business with plans for growth in the future. It offers an enviable and practical address in one of Sydney's major business and commercial centres. The advertised office space is perfect for a team of 4. If you need more or less space, we have over 30,000 furnished workspaces all over the world suitable for a team of 1 to 200+. Our award winning team offer a free service that will help you find the perfect solution for your needs, so reach out if you need more help. What you get for your weekly rent Furnished office with desks, chairs and lock up storage units Commercial grade internet service Telephone line and personalised phone answering Use of kitchen facilities with premium coffee/tea service Electricity usage included Complimentary receptionist to meet and greet your clients Prestigious business address Flexible terms from 1 month to long term Ability to bring your existing phone number over Business lounge with complimentary break out areas 24 x 7 Access to your office 24 x 7 security Office features Immaculate fit out and facilities Full mail management and postage Large boardroom and meeting rooms Signage board in foyer to highlight your business name Professional environment Server / Comms rooms available for server storage Building features Modern high rise classified as an "A" grade building 24 x 7 access to your office High speed lifts Car parking in building and surrounding areas Dedicated on site management team The advertised price includes building outgoings and is based on one person occupying the workspace. If you have 2 or more people extra fees will apply to cover off services like telephone, internet and kitchen amenities. 100m to bus stops 150m to Harris Park train station 250m to Supermarkets and Westfield shopping centre 40 minutes drive to and from Sydney Airport WHO IS OFFICE HUB? Office Hub is Australia & New Zealand\'s No 1 small office space commercial real estate agency. We have the largest collection of shared spaces, coworking and serviced offices in Australia & New Zealand, perfect for 1 100 employees. Let us take you on a tour of all the spaces that fit your needs and budget. Our service is complimentary and we work for you and the landlord to negotiate the most competitive deal in the market. Let us show you how shared and serviced offices can be the perfect solution for your business. www.office hub.com.au www.office hub.co.nz Conditions apply A portion of the square meterage factors in access to shared space. Price includes any incentives offered. This is for new tenants only. A Grade Building | Close To Public Transport | Fabulous Views $670pw | 5 Person Workspa..
PROPERTY OVERVIEW $670pw Price incl. Premium service office located in the Deloitte builidng in Parramatta. Prices includes Internet, Telephone, Electricity, Kitchen use Flexi terms Close to transport Fully furnished Regular cleaning Best Building in Parra 24/7 access Personal receptionist Recognised building Avail NOW for short or long term rent The Deloitte building is the iconic landmark in Parramatta being it's tallest building.This work environment is ideal for any dynamic business with plans for growth in the future. It offers an enviable and practical address in one of Sydney's major business and commercial centres. The advertised office space is perfect for a team of 5. If you need more or less space, we have over 30,000 furnished workspaces all over the world suitable for a team of 1 to 200+. Our award winning team offer a free service that will help you find the perfect solution for your needs, so reach out if you need more help. What you get for your weekly rent Furnished office with desks, chairs and lock up storage units Commercial grade internet service Telephone line and personalised phone answering Use of kitchen facilities with premium coffee/tea service Electricity usage included Complimentary receptionist to meet and greet your clients Prestigious business address Flexible terms from 1 month to long term Ability to bring your existing phone number over Business lounge with complimentary break out areas 24 x 7 Access to your office 24 x 7 security Office features Immaculate fit out and facilities Full mail management and postage Large boardroom and meeting rooms Signage board in foyer to highlight your business name Professional environment Server / Comms rooms available for server storage Building features Modern high rise classified as an "A" grade building 24 x 7 access to your office High speed lifts Car parking in building and surrounding areas Dedicated on site management team The advertised price includes building outgoings and is based on one person occupying the workspace. If you have 2 or more people extra fees will apply to cover off services like telephone, internet and kitchen amenities. 100m to bus stops 150m to Harris Park train station 250m to Supermarkets and Westfield shopping centre 40 minutes drive to and from Sydney Airport WHO IS OFFICE HUB? Office Hub is Australia & New Zealand\'s No 1 small office space commercial real estate agency. We have the largest collection of shared spaces, coworking and serviced offices in Australia & New Zealand, perfect for 1 100 employees. Let us take you on a tour of all the spaces that fit your needs and budget. Our service is complimentary and we work for you and the landlord to negotiate the most competitive deal in the market. Let us show you how shared and serviced offices can be the perfect solution for your business. www.office hub.com.au www.office hub.co.nz Conditions apply A portion of the square meterage factors in access to shared space. Price includes any incentives offered. This is for new tenants only. Regular Cleaning | Prestigious Location | Fully Furnished $336pw | 3 Person Workspa..
PROPERTY OVERVIEW $336pw Price incl. Professional and economical serviced offices located in the heart of the key business district of Parramatta. Price incl. Internet, Rent, Electricity, Building Outgoings, All Utility Bills Fully furnished & private Flexi terms Economical option Regular Cleaning 24/7 access recognised address Central Location Avail NOW for long or short term rent This building is located in the business district of Parramatta, 400m from the Parramatta Train and Bus Interchange and with easy access to arterial roads. The office is suitable for any type of business seeking a fully furnished office at an affordable price. Tenants can enjoy ample secure parking, a dedicated receptionist and great natural light in the building. The advertised office space is perfect for a team of 3. If you need more or less space, we have over 30,000 furnished workspaces all over the world suitable for a team of 1 to 200+. Our award winning team offer a free service that will help you find the perfect solution for your needs, so reach out if you need more help. What you get for your weekly rent Furnished office with desks, chairs and lock up storage units Complimentary receptionist to meet and greet your clients Unlimited commercial grade internet service Electricity usage included Regular cleaning Telephone number & handset Unlimited kitchen supplies, incl. tea, coffee & filtered water Prestigious business address to put on your cards Flexible terms from 1 month 2 years Ability to bring your existing phone number over 24 x 7 access to your office 24 x 7 security Office features Modern facilities Full mail management and postage Large boardroom and meeting room for use Signage board in foyer to highlight your business name Quality finishes and amenities throughout Professional environment Server / Comms rooms available for server storage Building features Central Location Car parking in building and surrounding areas Dedicated on site management team Close to buses, trains 500m to Westfield shopping centre Close to Banks, restaurants and hotels 20kms to Sydney CBD 30min drive to Sydney Airport WHO IS OFFICE HUB? Office Hub is Australia & New Zealand\'s No 1 small office space commercial real estate agency. We have the largest collection of shared spaces, coworking and serviced offices in Australia & New Zealand, perfect for 1 100 employees. Let us take you on a tour of all the spaces that fit your needs and budget. Our service is complimentary and we work for you and the landlord to negotiate the most competitive deal in the market. Let us show you how shared and serviced offices can be the perfect solution for your business. www.office hub.com.au www.office hub.co.nz Conditions apply A portion of the square meterage factors in access to shared space. Price includes any incentives offered. This is for new tenants only. Central Location | Recognised Building | Dedicated Receptionist $141pw | 1 Person Workspa..
PROPERTY OVERVIEW $141pw Price incl. Serviced office space with professional vibe in Parramatta. Price incl. Internet, Rent, Electricity, Building Outgoings & All Utility Bills Flexi terms Regular cleaning Recognised building 24/7 access Dedicated receptionist Central Location Other sizes available Avail NOW for short or long term rent 91 Phillip is an iconic building located in the heart of Parramatta's business district occupying one of the highest profile positions on the corner of Phillip and Smith Street. The building's prime position affords its fantastic access to services, amenities and transport. The building offers modern end of trip facilities (including showers, bike storage, lockers and change rooms), a ground floor cafe and a secure car park, making this a great opportunity for any business or individual who prioritises convenience! The advertised office space is perfect for a team of 1. If you need more or less space, we have over 30,000 furnished workspaces all over the world suitable for a team of 1 to 200+. Our award winning team offer a free service that will help you find the perfect solution for your needs, so reach out if you need more help. What you get for your weekly rent Furnished office with desks, chairs and lock up storage units Complimentary receptionist to meet and greet your clients Unlimited commercial grade internet service Electricity usage included Regular cleaning Telephone number & handset Prestigious business address to put on your cards Flexible terms from 1 month 2 years Ability to bring your existing phone number over 24 x 7 access to your office 24 x 7 security Office features Modern facilities Full mail management and postage Large boardroom and meeting room for use Signage board in foyer to highlight your business name Quality finishes and amenities throughout Professional environment Server / Comms rooms available for server storage Building features High speed lifts Car parking in building and surrounding areas Dedicated on site management team Adjacent to Buses and Trains 500m to Westfield shopping centre Close to Banks, restaurants and hotels 20kms to Sydney CBD 27kms to Sydney Airport WHO IS OFFICE HUB? Office Hub is Australia & New Zealand\'s No 1 small office space commercial real estate agency. We have the largest collection of shared spaces, coworking and serviced offices in Australia & New Zealand, perfect for 1 100 employees. Let us take you on a tour of all the spaces that fit your needs and budget. Our service is complimentary and we work for you and the landlord to negotiate the most competitive deal in the market. Let us show you how shared and serviced offices can be the perfect solution for your business. www.office hub.com.au www.office hub.co.nz Conditions apply A portion of the square meterage factors in access to shared space. Price includes any incentives offered. This is for new tenants only. Central Location | Fully Furnished | Recognised Building $610pw | 6 Person Workspa..
PROPERTY OVERVIEW $610pw Price incl. Professional and economical serviced offices located in the heart of the key business district of Parramatta. Price incl. Internet, Rent, Electricity, Building Outgoings, All Utility Bills Fully furnished & private Flexi terms Economical option Regular Cleaning 24/7 access recognised address Central Location Avail NOW for long or short term rent This building is located in the business district of Parramatta, 400m from the Parramatta Train and Bus Interchange and with easy access to arterial roads. The office is suitable for any type of business seeking a fully furnished office at an affordable price. Tenants can enjoy ample secure parking, a dedicated receptionist and great natural light in the building. The advertised office space is perfect for a team of 6. If you need more or less space, we have over 30,000 furnished workspaces all over the world suitable for a team of 1 to 200+. Our award winning team offer a free service that will help you find the perfect solution for your needs, so reach out if you need more help. What you get for your weekly rent Furnished office with desks, chairs and lock up storage units Complimentary receptionist to meet and greet your clients Unlimited commercial grade internet service Electricity usage included Regular cleaning Telephone number & handset Unlimited kitchen supplies, incl. tea, coffee & filtered water Prestigious business address to put on your cards Flexible terms from 1 month 2 years Ability to bring your existing phone number over 24 x 7 access to your office 24 x 7 security Office features Modern facilities Full mail management and postage Large boardroom and meeting room for use Signage board in foyer to highlight your business name Quality finishes and amenities throughout Professional environment Server / Comms rooms available for server storage Building features Central Location Car parking in building and surrounding areas Dedicated on site management team Close to buses, trains 500m to Westfield shopping centre Close to Banks, restaurants and hotels 20kms to Sydney CBD 30min drive to Sydney Airport WHO IS OFFICE HUB? Office Hub is Australia & New Zealand\'s No 1 small office space commercial real estate agency. We have the largest collection of shared spaces, coworking and serviced offices in Australia & New Zealand, perfect for 1 100 employees. Let us take you on a tour of all the spaces that fit your needs and budget. Our service is complimentary and we work for you and the landlord to negotiate the most competitive deal in the market. Let us show you how shared and serviced offices can be the perfect solution for your business. www.office hub.com.au www.office hub.co.nz Conditions apply A portion of the square meterage factors in access to shared space. Price includes any incentives offered. This is for new tenants only. Here is your chance to secure a high quality office in close proximity to Parramatta CBD. Offered fully fitted and furnished with no expense to spare, the premises includes; Multiple glass partitioned offices Over 40 workstations Spacious reception Meeting rooms Large boardroom Staff breakout room Kitchen Small portion of high clearance warehousing Over 30 cars paces available on site! Areas quoted are approximate. Prime Location | Bike Racks & Showers | Regular Cleaning $1087pw | 15 Person Works..
PROPERTY OVERVIEW $1087pw Price incl. Fully furnished, modern and spacious in a prime Parramatta location – this open plan shared office is a cut above the rest! Enjoy meeting room access, high speed fibre and 24/7 access/security to this light filled seventh floor office in the heart of Parramatta. There’s a large modern shared kitchen and air con throughout with your costs cut through sharing and all your outgoings paid for in a simple monthly bill. This office would suit an established medium sized business looking to commit to a great space for 2+ years! This shared office occupies level 7 of a quality A Grade tower located in Parramatta’s financial core with all the essential facilities you might need –, high security, on site concierge and end of trip facilities such as showers and bike racks. It is ideally situated close to “Eat Street” – West Sydney’s true cuisine destination – and to Church Street, Westfield Mall, Rivercat Ferry and Parramatta Railway Station. The building was built with sustainability in mind and has achieved a 4 Star NABERS Energy Rating. The advertised work space is perfect for a team of 15. If you need more or less space we have furnished and unfurnished offices ready to go from 10sqm 200sqm all over Australia and New Zealand. What you get for your weekly rent , 24/7 Access , 24/7 Security , Access to kitchen facilities , Access to meeting room , Building outgoings included , Commercial grade internet , Electricity usage included , Regular cleaning , A fully furnished office Building features , Air conditioning , Bike racks , Dedicated men and ladies bathrooms , Disabled facilities , Showers , Direct access to public transport , Gym and fitness centre close by 100m to fantastic restaurants such as Liana's Italian, Bondi Pizza, El Phoenician, Saute Thai 800m to Parramatta Railway Station (28 minute train journey to Sydney Central Station) Riverbank Secure Carparking and East Street Carpark 50m away 250m to relax at the River Foreshore Reserve 270m to Parramatta Police Station, District Court and Local Court WHO IS OFFICE HUB? Office Hub has largest collection of shared office space, sublet office space, creative coworking office space and serviced offices, perfect for 1 200 employees. Let us take you on a tour of all the spaces that fit your needs and budget. Our service is complimentary and we work for you and the landlord to negotiate the most competitive deal in the market. Let us show you how shared and serviced offices can be the perfect solution for your business. All pricing shown excludes any local taxes such as GST or VAT Conditions apply A portion of the square meterage factors in access to shared space. The advertised price includes any incentives offered based on a 12 month agreement. If a shorter period is agreed to please note the price may increase accordingly. This promotional offer for new tenants only and may be withdrawn at any time due to space availability. Core Cbd Location | Areas From 385 - 935 Sqm Only $380.00 / sqm / annu..
81 George Street is a boutique office building in the absolute core of Parramatta's CBD. North facing, and consisting of only three levels of good quality space that won't break the budget. Centrally located, 81 George Street is within close proximity to public transport including Parramatta Ferry Terminal, Rail Station and Bus Stops. Belroy Property are pleased to offer Levels 1 and 2, each consisting of 935 square metres of space. Enquire with us about dividing the space from as low as 385 square metres. Potential to retain existing fit out or open plan this is an opportunity not to be missed. Freestanding Building 1,370sqm ONLY $225.00 per sqm per ..
Busy Retail Location | Church Street Reduced to $85,000 per an..
Prime location on Church Street (between George and Macquarie Street) in Parramatta's main retail hub. Close to all major Banking Institutions and JB Hi Fi. Large glass shop front suitable to most retail / commercial uses.